American Ambulance Service, Inc. was established June 24, 1972, by founder Ron Aliano. It was Ron’s intent to provide the highest quality EMS care and since his passing in October 2009 that remains our focus today. Ron started with two used ambulances and the operation was run out of the back of a local service station in Norwich, CT. 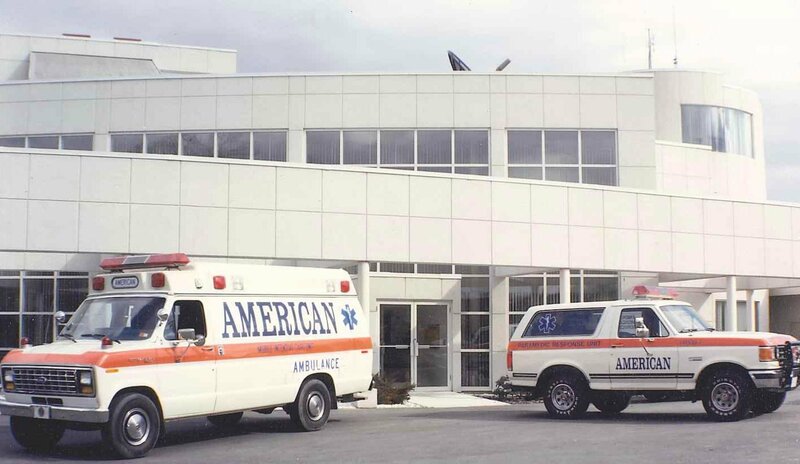 In 1981 American moved to 101 West Main in Norwich with a fleet of 5 ambulances. In 1986 we relocated again to our current contemporary building at One American Way, Norwich, CT where we overlook The Marina at American Wharf and the Thames River. This building is considered a modern-day landmark in the city. American introduced Paramedic level care to all of Eastern Connecticut in 1983 when Ron decided he wanted to expand his dream by providing this higher level of care to communities outside of Norwich. Another significant benchmark for American occurred on April 6, 1998, when we became the EMS provider for the Mashantucket Pequot Tribal Nation and Foxwoods Resort & Casino, the largest casino in the world! On July 1, 2009, American secured the Paramedic Provider Agreement with the Northeast Connecticut Council of Governments (NECCOG) in which we provide a dedicated ALS intercept vehicle to participating NECCOG member towns. Ron’s dream has grown over the years to a fleet of over 50 vehicles including our new state of the art Sprinters. It also includes top of the line technology in the field and within its office operations including dispatch and billing. This visionary instituted rigorous standards of excellence which are benchmarks not only here at American but within EMS itself. As a testimony to this, American still employs numerous team members that signed on to be part of Ron’s quest in the 70’s and we currently employ just over 200 dedicated team members. American Ambulance Service, Inc. continues to find new and innovative ways to serve our community and advance Ron’s dream.